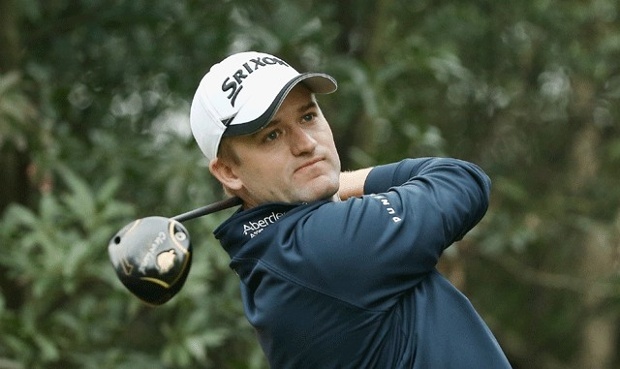 Srixon staffer, and Scotland’s own, Russell Knox outlasted a tremendous field in Shanghai this weekend, including Danny Willett’s stellar 62 on Sunday in full chase mode, to capture the World Golf Championships –HSBC Champions title, his first on the PGA Tour in 92 previous starts. Quite the story, considering just ten days ago he was the 7th alternate into the field. Sunday’s win also comes with a nice present to add to the $1.4 million check: a berth in next year’s Masters. In a day and age where Tour players are typically being given the latest and greatest in golf technology to add to their bags before clubs hit the market for public sale, Knox wielded a Cleveland Classic XL Custom driver, previously launched in 2013, with an Aldila Tour Blue 65 Tour X shaft. This particular driver had the largest and deepest face and sweet spot of any driver on the market. The massive amount of forgiveness of this driver, even for a Tour player, has enabled Knox to stay in the top 30 of driving accuracy on Tour in 2015. Additionally, Knox has been playing with some other throwback goodies in his fairways and hybrid. He has a 15 and 19 degree Cleveland Launcher series fairways with Miyazaki Kusala Black 83X shafts, a Launcher DST 3 hybrid and Mashie 4 hybrid with Aldila VS Proto 95X shafts. Where Knox has stepped up the technology is in the iron, wedge, and golf ball category. Augmenting his two hybrids are a Srixon Z-545 5-iron and Z-745 6 through 9 iron with Dynamic Golf X-100 shafts. Three Cleveland 588 RTX wedges (48, 54, & 60) add to Knox’s prowess for greens-in-regulation percentage and strokes gained tee-to-green, where he was 7th and 23rd respectively on Tour during the 2015 season. Completing the puzzle is the Srixon Z-star (4th generation) golf ball. The performance of this golf ball epitomizes Srixon’s “Journey to Better” campaign and why the company is making large inroads in the golf ball market, both in the public sector and on tour. Second generation SpinSkin technology in the cover material increases friction by 18% and softness by 21% compared to the previous generation of Z-star, giving Knox the ability to have tremendous greenside spin and control, especially with the Rotex wedge face technology. Speed Dimples are incorporated to provide the appropriate combination of consistent launch and distance that the better players desire for today’s longer courses and more challenging green complexes. In the battle for the number one player in the world, Jordan Spieth reclaimed the position over Rory McIlroy with his tie for 7th at 15 under, one shot ahead of McIlroy. Spieth had one impressive round on the week, a sizzling 63 on moving day (Saturday), but struggled finding his rhythm on a damp and dreary Sunday in China. McIlroy battled food poisoning prior to this week’s tournament, but proclaimed himself ready to go so it is unknown if that truly affected his performance. Finally, three Callaway staff members finished inside the top 5, with Kevin Kisner finishing solo 2nd, the aforementioned Willett ascending into a tie for 3rd, and Branden Grace finishing in a tie for 5th. Rounding out the top 5 were Ross Fisher (T-3) and USA’s Dustin Johnson (T-5).